Summer irrigation repairs were completed this week. We thank all the owners who reported irrigation problems and deficiencies as we requested last week. 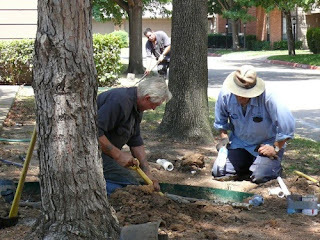 Eight homes lost irrigation this last week due to corrosion of the underground wires on Wilshire Dr. and in Wilshire Ct. These types of failure are very hard to repair and require locating and tracing underground wires through large tree roots systems and under driveways. This was further complicated by the FiOs and underground cable and phone wires that had to be located by the utility companies and very carefully dug around. Twenty-two (22) man hours were needed to do the exploration, excavation, and repairs. This repair puts the Association $900 over budget for irrigation repairs for the year. The $3.9K spent so far in 2013 is consistent with the 10 year ($4.1k) and 4 year averages ($3.9k). The Association spent $7.4K in 2010 and $1.8K, $2.4K in 2011 and 2012 respectively. The system is, again, fully up and the water cycles have been increased to address that the warm weather that is on us. If you have any questions about your scheduled waterings or feel an adjustment is needed, please contact us. We appreciate the all the eyes we can get on this 22 zone system.